But Finland was the real shocker — living up to its reputation as the ‘sick man of Europe’ with a 0.6% contraction. Only Greece beat expectations – shrinking by a mere 0.5%, not the 1% expected. That tells you something about the accuracy of City forecasts, and the turmoil in the Greek economy this year. When a 0.5% contraction is ‘good news’, you know you’re been through the mire. The July to September figures mark a slowdown from eurozone GDP growth of 0.4% in the second quarter and 0.5% in the first quarter and come as the European Central Bank (ECB) hints that it is planning to inject further funds into the eurozone economy to maintain recovery…..
Today’s figures also show that Greece’s faltering recovery has been wiped out in the last three months. 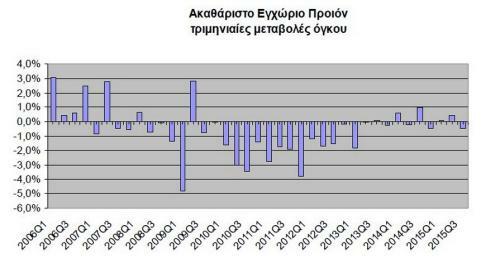 Greek GDP contracted by 0.5% in the July-September quarter, Eurostat says, having risen by 0.4% in April-June. That’s not a surprise, given the bailout drama this summer which saw banks shuttered and capital controls imposed. Breaking: The eurozone economy grew by just 0.3% in the third quarter of the year. That’s a slowdown on the 0.4% recorded three months earlier, showing that Europe’s recovery remains fragile and lacklustre despite the huge stimulus measures launched by the European Central Bank this year. It’s also weaker than expected — economists had expected 0.4% growth. 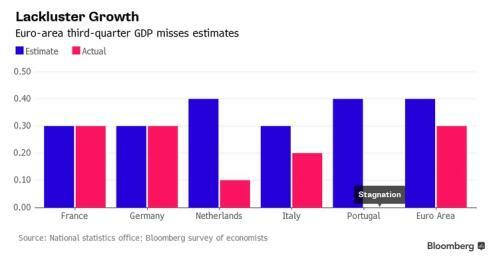 #Portugal & #Italy Q3 GDP data disappointing. Italian economy losing steam, while Portuguese econ falls flat. 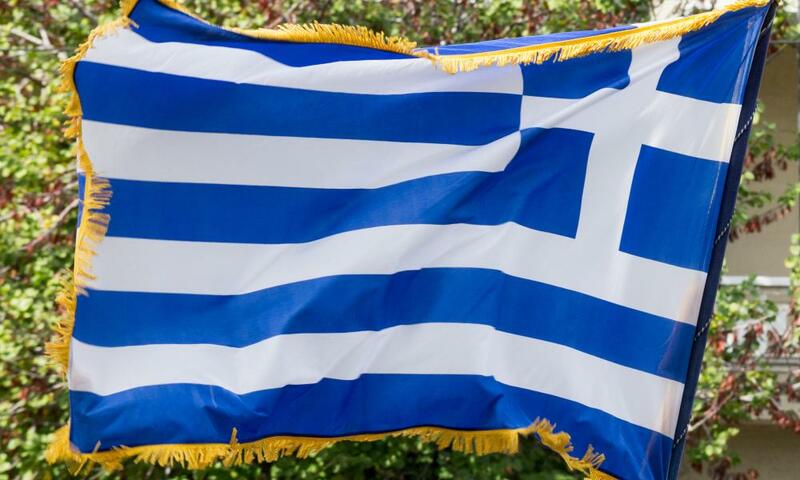 #Greece data due in 2 mins. Brussels officials have pointed to Portugal as an example that tough fiscal consolidation can deliver results. 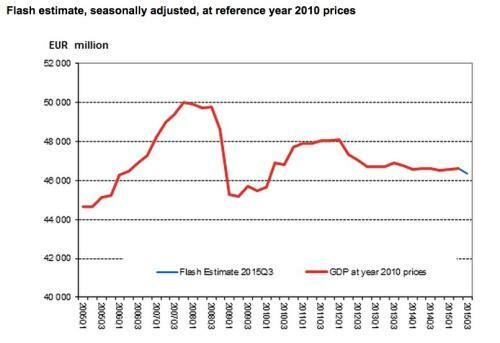 Today’s disappointing (no) growth figures may prompt a rethink…. Growth in Portugal, the euro zone’s poster child for reform and austerity, evaporates in Q3. GDP 0.0% vs +0.4% forecast. More gloom. Portugal’s recovery ran out of steam in the last quarter, just as its political crisis escalates. GDP was flat in the July-September quarter, after growing by 0.5% in the second quarter. That’s much weaker than the 0.4% economists had expected, and looks like the weakest quarter in 18 months. Comparing with the second quarter, GDP registered a null change rate in real terms in the third quarter (0.5% in the second quarter). The contribution of domestic demand was negative, mainly due to the reduction of Investment, while net external demand contributed positively, with Imports of Goods and Services decreasing more intensely than Exports of Goods and Services. 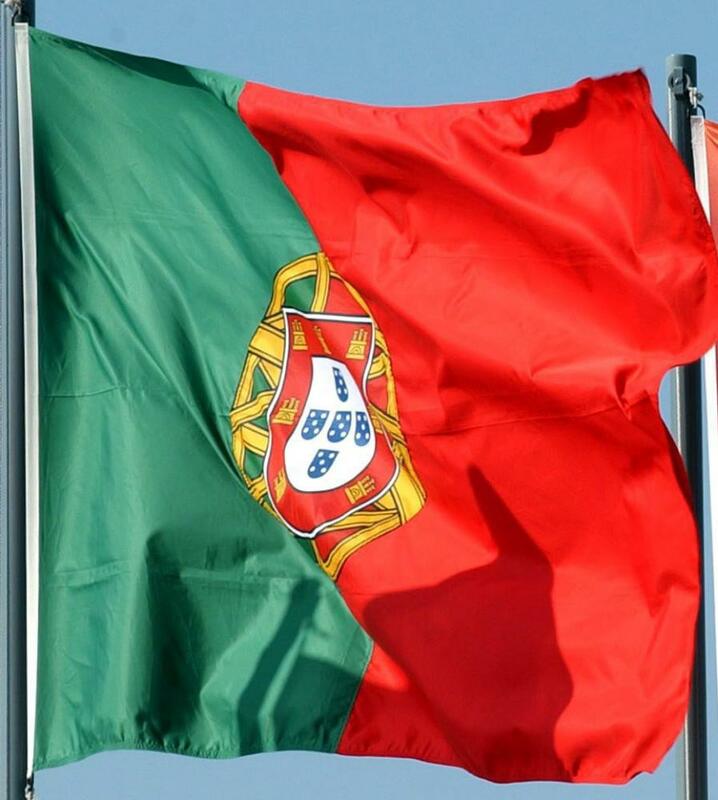 On an annual basis, Portuguese GDP grew by 1.4%, down from 1.6% three month ago. This comes as Portugal’s left-wing parties vow to overturn its austerity programmes and implement more growth-friendly measures, having overturned its centre-right government this week. We now have to wait until 10am GMT for the official eurozone-wide GDP reading for July-September. But it’s already clear that this wasn’t a great quarter for Europe, with a weak trade performance dragging back the three largest eurozone economies. Economist Fred Ducrozet reckons eurozone growth will fall short of the 0.4% expected, to 0.3%. 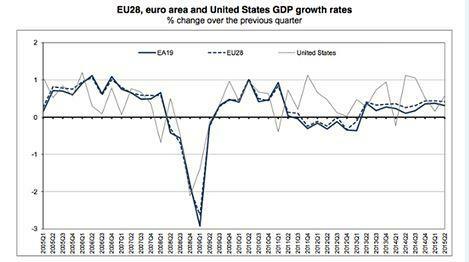 Slight disappointment in Italy and in the Netherlands means Eurozone GDP likely to grow by 0.3% QoQ only in Q3. Here comes Italy’s GDP report….and it’s weaker than hoped. 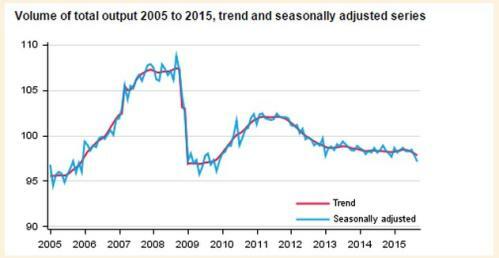 The Italian economy grew by just 0.2% in the third quarter of 2015, dashing expectations of a 0.3% expansion. It suggests Italy’s recovery is running out of steam. 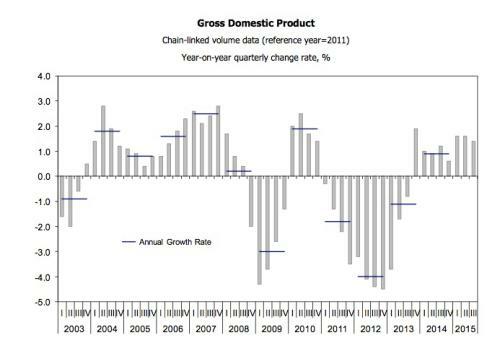 GDP rose by 0.4% in the first quarter of 2015, dipping to 0.3% in the second quarter – and now just 0.2% in Q3. Finland is used to cold, dark winters, and the experience could stand it in good stead as the Nordic country’s bitter economic cold snap shows no sign of a thaw. 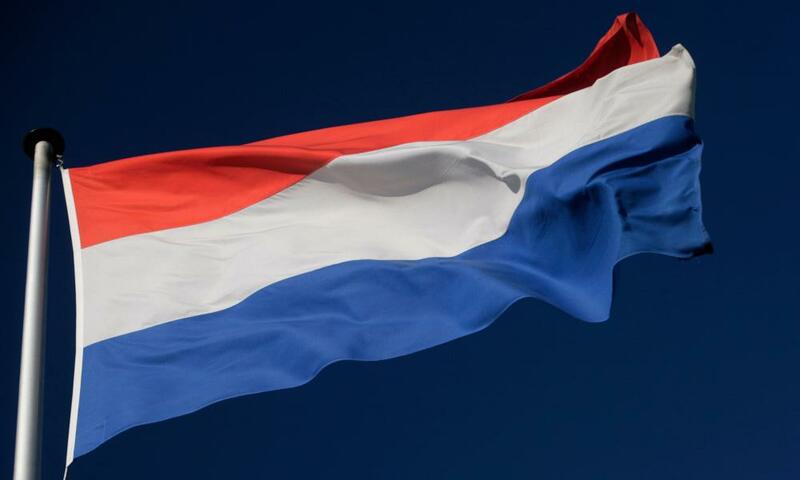 Next up, the Netherlands…. 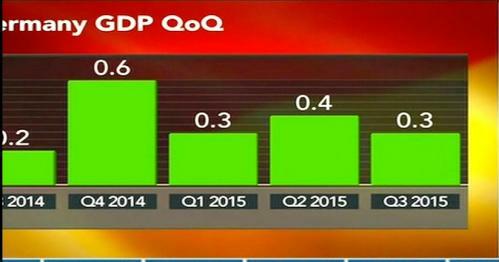 and its economy struggled to grow in the last quarter. GDP rose by just 0.1% in the July-September quarter, a very modest performance. And second-quarter GDP has been revised down, to just +0.1% from +0.2% originally. That left the economy 1.9% larger than a year ago, weaker than forecast. 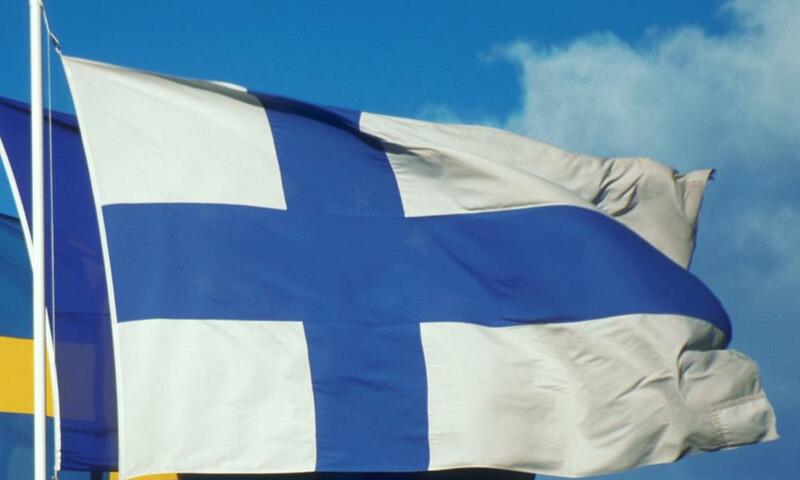 Finland has cemented its growing reputation as one of Europe’s most ailing members. Finnish GDP contracted by 0.6% in the last quarter, according to new data this morning. That left Finland’s economy 0.8% smaller than a year ago. The fall in natural resource prices, the demise of Nokia, and the knock-on impact of Russia’s economic problems are all hurting. Having been one of the cheeleaders for eurozone austerity, Finland now finds itself in a very tough position. It is trying to cut spending to keep its deficit within the limits set by Brussels, which is hurting attempts to return to growth. Two months ago, finance minister Alex Stubb admitted “we are the sick man of Europe.” Today’s figures don’t challenge that diagnosis. #Hungary‘s lower-than-expected 3Q GDP growth is fuelled by car making, trade and tourism services, statistics office says. Slovakia has outpaced its larger neighbours to the west, with growth of 0.9% in the last three months. That’s up from 0.8% in the second quarter. The Czech Republic has beaten expectations, with growth of 0.5% in the last quarter. City analysts have been chewing through France’s GDP figures, and they’re not too impressed. RBC on #France: Only volatile inventories prevented outright contraction, given that net trade shaved off -0.7pp from top-line growth. While Barclays says France’s economy is still vulnerable. More data. Hungary has missed forecasts by posting annual growth of 2.3% in the last quarter, down from 2.7% three months earlier. On a quarter-on-quarter basis, Hungary (which isn’t in the eurozone) grew by 0.5%. Germany’s economy would be in a worse state if consumers weren’t benefiting from cheaper energy costs, points out Holger Sandte of Nordea Markets. This morning’s figures show that Britain has outpaced its two largest European rivals in the last quarter. UK GDP grew by 0.5% between July and September, data released last month showed. That’s obviously better than France and Germany, and also beats America (which grew by around 0.4% in Q3). Germany’s economy has been dented by problems overseas, says Carsten Brzeski of ING. The summer weakness of the German industry seems to be more substantial than only a vacation-driven soft spell. The turmoil in emerging markets and the Chinese slowdown have finally left some marks on the German economy. More generally, the German industry has not managed to accelerate and shift up one gear. Somehow, the weak euro and extremely favourable financing conditions have not fully deployed their full impact on the industry, yet. This is partly the result of weakening external demand but also still the structural lack of investment incentives and projects. Consumer spending, though, is still strong. More here. No details for German GDP. Stats office says “positive contributions were made mainly by domestic final consumption” but NOT foreign trade. This German GDP report “isn’t overwhelming”, says Bloomberg’s Hans Nichols, but at least the its economy is still growing. The slight slowdown in the last quarter suggests Germany has been hit by problems in emerging markets such as China. 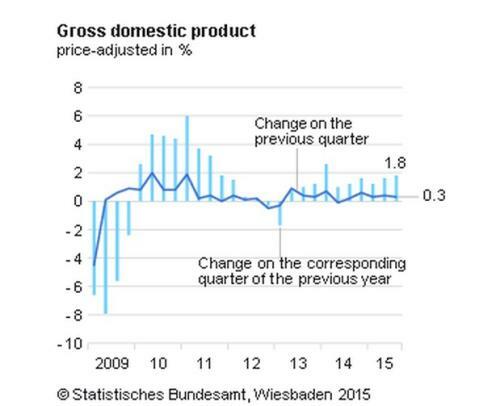 The German GDP report is online here. 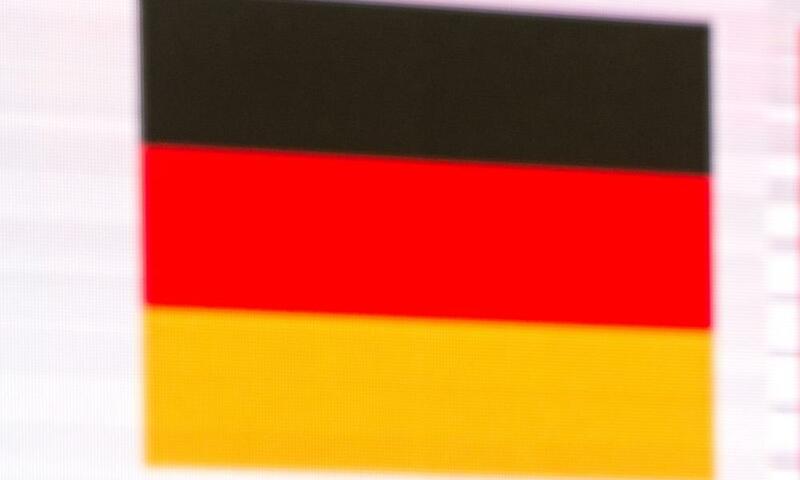 Here comes Germany’s GDP data…. and it shows that Europe’s largest economy grew by 0.3% in the last quarter. That matches France’s performance, and is a slightly slowdown on the 0.4% recorded in April-June. Germany’s stats office says that consumer and government spending both rose. Trade had a negative impact on growth, though, with imports growing faster than exports…. French finance minister Michel Sapin has welcomed today’s GDP data. He told AFP newswires that France has escaped a long period of very low growth. 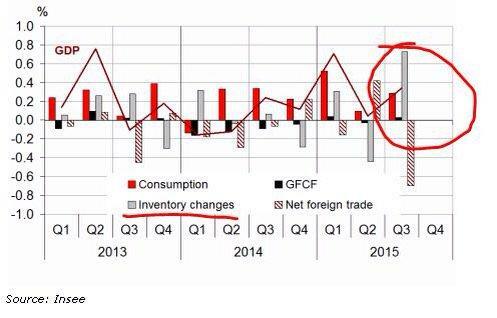 Ugly net trade data in French GDP, brace for German release in a few. It will be a stinker I think. France’s return to growth was driven by household spending (up 0.3%) and business investment (up 0.7%). But the trade picture is quite ugly. Exports fell by 0.6%, while imports grew by 1.7%. So net trade actually knocked 0.7% off GDP, but this was compensated by firms bolstering their inventories. Without that, the figures look worse. The French GDP report is online here. France’s economy is now 1.2% larger than a year ago, slightly better than the 1.1% annual growth economists expected. #France kicks off Super GDP Friday w/ decent numbers. 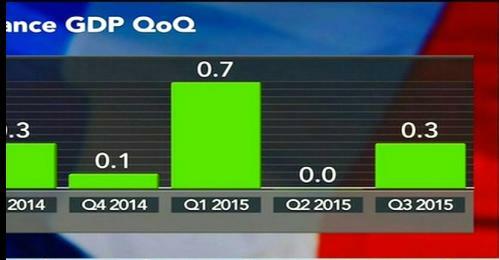 French 3Q GDP grew +0.3% on quarter as exp after 0% in Q2. France has got eurozone GDP day up and running by returning to growth. 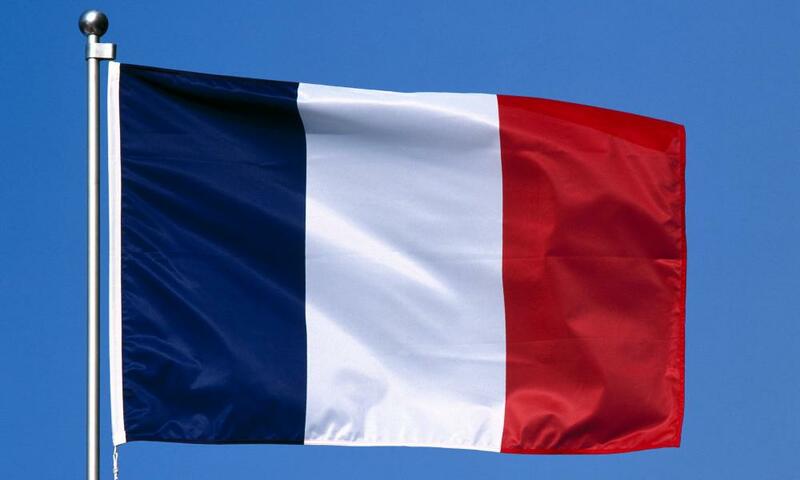 French GDP increased by 0.3% in the last quarter, the INSEE stats office reports. That follows zero growth in the April-June quarter, which fuelled fears that the French economy was stalling. Hang out the bunting and put on the party hats, folks. It’s eurozone GDP day! We’re about to discover how countries across Europe performed in the third quarter of 2015, from heavyweights like Germany and France to smaller members like Slovakia and Portugal. It’s Q3 GDP #SuperFriday in the euro area! 1st in line is France (6.30am), followed among others by Germany (7am) & Italy (9am). Stay tuned! Actually, you shouldn’t blow up too many balloons, because we’re probably going to learn that Europe’s recovery remains jammed in second gear. Economists predict that the eurozone expanded by just 0.4% in the July-to-September quarter. That would match the performance in the second quarter of the year. Better than a recession, but not rapid enough to deal with Europe’s persistent unemployment and debt problems. A poor number today would suggest that Europe has been hit harder than we thought by problems in emerging markets over the summer. It may also show the impact of the Greek bailout crisis on the region. But anything stronger than 0.4% would be welcome. The data will also influence whether the European Central Bank feels forced into taking fresh action to stimulate the eurozone economy – a boost to its bond-buying QE programme is already looking likely.